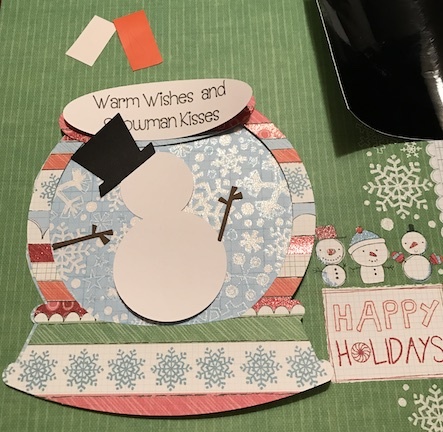 This snowman card is designed in Cricut Design Space. 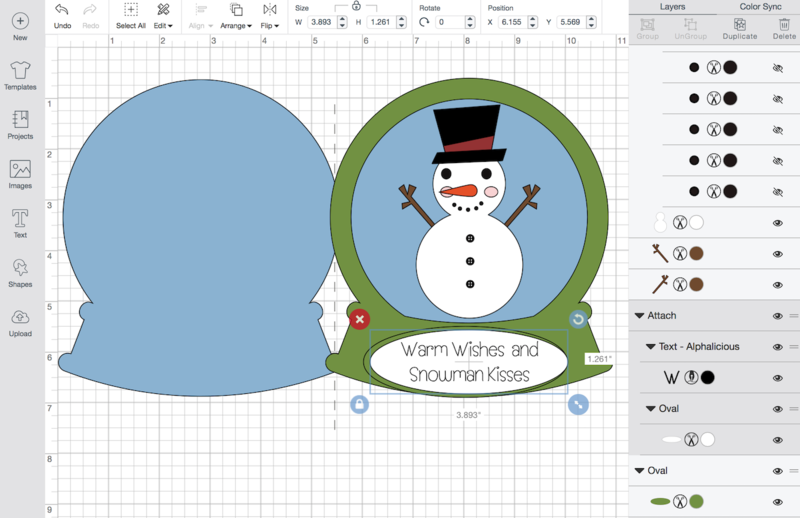 The snowman svg is from https://lovesvg.com/2017/11/snowman-4652/ and the snow globe card svg is from https://www.birdscards.com/free-svg-cut-files/christmas-svgs/christmas-snowmen-snowflakes-and-snowglobes/. Each of these svg have to be uploaded into Cricut Design Space. I used Recollections Festivus Paper Stack that I have had for many years. 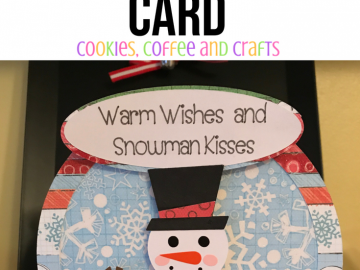 Then design your card with the snowman and the saying. 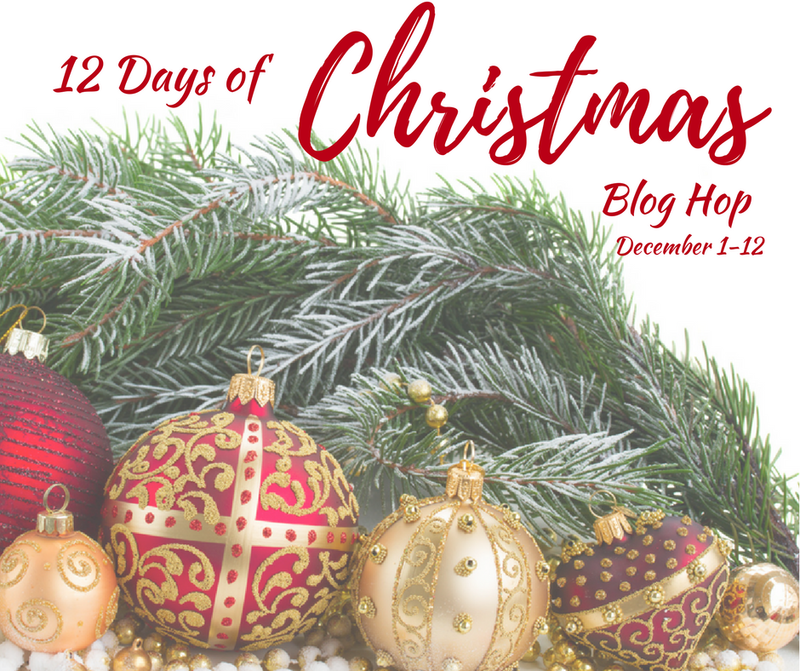 For the saying I used the font Alphalicious, which has to be purchased in design space. 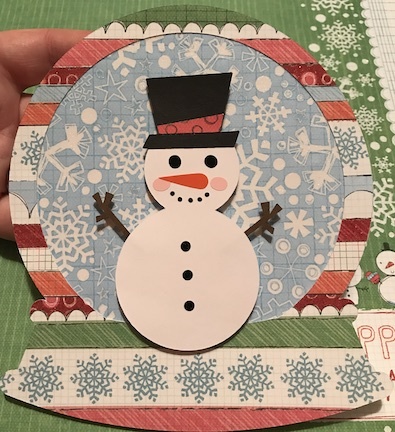 In my original design I had the oval saying at the bottom of the snow globe, but after the paper was cut I loved the snowflakes across the bottom. So I decided to put the saying at the top of the snow globe. 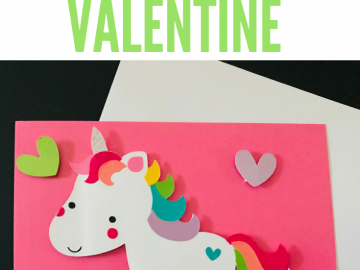 Cut your images and card with the Cricut Explore. 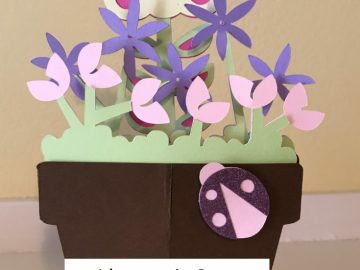 I did a mix of paper and vinyl on this card because I find it easier to use the vinyl for small pieces. The vinyl works great because it’s self adhesive. Star with the snowman and glue the black hat to the snowman and the sash onto the hat. 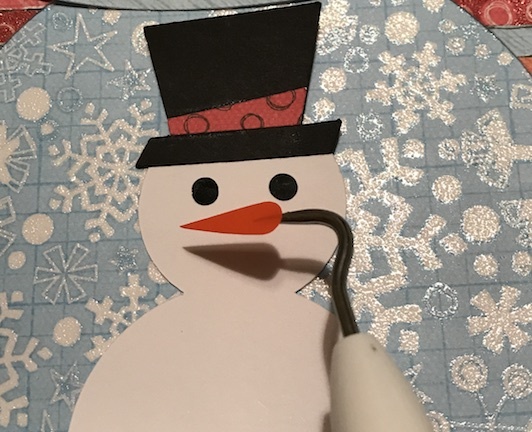 Then start on the snowman’s face. 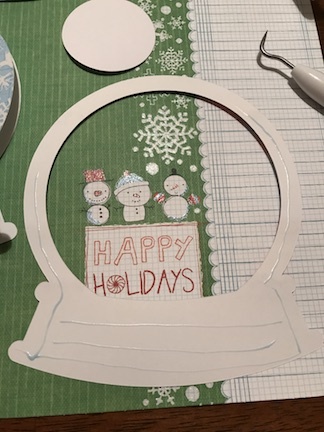 I used my Cricut tool to lay the vinyl pieces onto the snowman. Make sure you add the pink cheeks before the carrot nose. 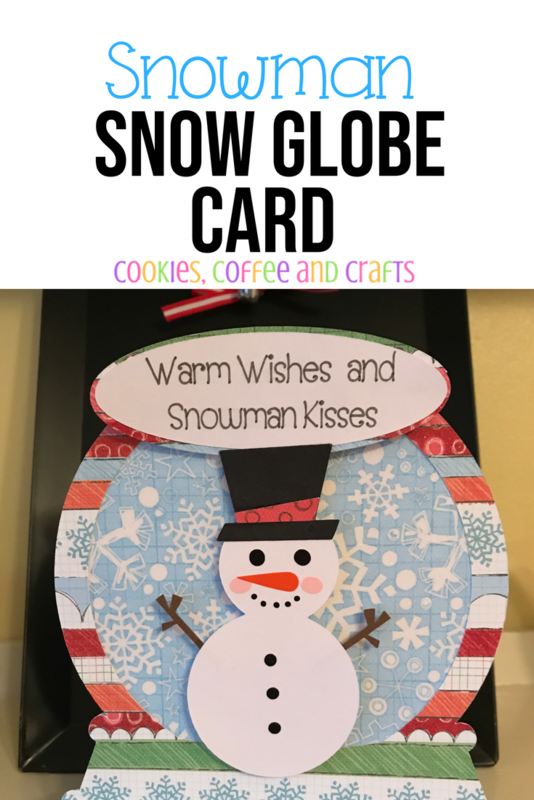 Glue on the outline of the snow globe using Zig Memory System 2 Way Glue Pen. 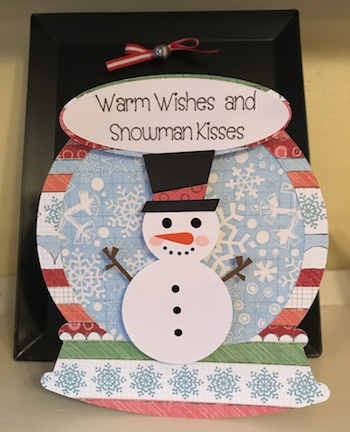 Then add the snowman and the saying using 3D Pop Dots to give the card a 3 dimensional look. The inside of the card is blank so it can be personalized. This card is really neat when it stands because it rocks. 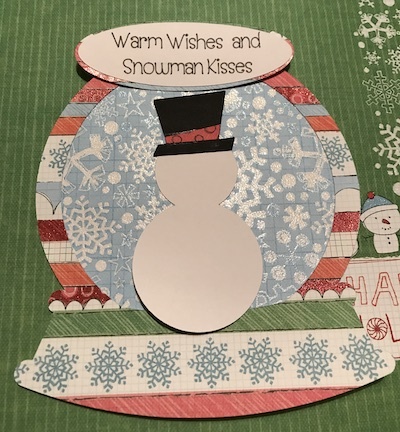 When I think of snowman, I think of snow globes and the wintry scenes of the snow falling down and I feel like this card captured that feeling and scenery of a snow globe.